In an effort to boost local tourism in Tanzania, and show the locals how richly blessed their country is in terms of tourist attractions, the management of Kilimanjaro National Park (KINAPA) is offering Tanzanians a day to tour Mount Kilimanjaro at half price. The offer will be in effect from 15-18 May of this year and the price has been cut down to 5000/- for adults and 1000/- for children for a day tour which includes free transport from Kiwire Supermarket at Bomang’ombe, Hai District and Fresh Coach Restaurant in Moshi Town. The tourists are however expected to carry their own food, equipment and whatever gadgets they may need. Ms Eva Mallya the head of the tourism department in KINAPA said they came up with the strategy of cutting down the price for the locals because they are not happy with the low number of locals who visit the park. Many tourists come from all over the world to see and trek up Mount Kilimanjaro but the locals who are close to it don’t seem to be interested in what exists in their backyard. The half price offer is open to nationals of east African community member countries. Ms Mallya hopes that after these nationals from the neighbouring countries Uganda, Kenya, and Rwanda enjoy the tour, they will spread the word in their home towns and countries which will in turn boost tourism and income for KINAPA. Everyone going for the trip will be taken up with vehicles up to Shira plateau. then they can begin their exploration. The plateau used to be the highest peak on the mountain but it was submerged to form the famous plateau about one thousand years ago. 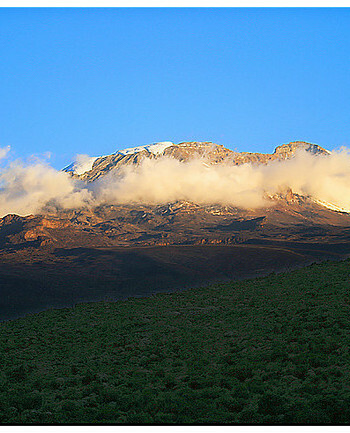 Compared to Mawenzi peak and Kibo peak, Shira plateau is relatively unknown. .
Those who wish to take up the offer can register at Kilimanjaro Christian Medical Centre (KCMC), Kiwire Supermarket, and Kinapa at Marangu, Same Stand at Himo Crossroad, or as Fresh Coach Restaurant. According to Ms Mallya, people just need to change the way they spend their free time especially weekends, rather than go to restaurants, playgrounds and bus, they can go trekking mount Kilimanjaro with their children and friends. KINAPA is a very popular tourist destination in Tanzania, most people on Tanzania safaris always makes it appoint to visit Mount Kilimanjaro. In fact the tourist numbers visiting the park increases from 25450 in 2001/2002 to 55,553 in 2012/2013, but it is unfortunate that the locals form just a small percentage of that number. About 5-6%. We hope the half priced tours pay off for the KINAPA management.